In this article I'll show you how to configure the ADSL/Cable router of E-Tech for use with ADSL by KPN (MXStream). It will take you about 5 minutes to configure the router. By the way: this is a pretty cheap router/switch: app. $120. LINK Green if the ADSL/Cablemodem is connected properly. ACT Blinks orange when data is exchanged between router and ADSL/Kabelmoden. Port 1 is connected (Orange = 10 Mbps, Green = 100 Mbps) and blinks at data transfer. Port 2 is connected (Orange = 10 Mbps, Green = 100 Mbps) and blinks at data transfer. Port 3 is connected (Orange = 10 Mbps, Green = 100 Mbps) and blinks at data transfer. Port 4 is connected (Orange = 10 Mbps, Green = 100 Mbps) and blinks at data transfer. Keeps burning orange when using full-duplex data transfer between router and PC. Blinks orange when PC and router use a half-duplex connection. Sometimes this causes so called collisions. A switch to cross the Ethernet port nr 4. It switches between a normal (straight) connection and a uplink (crossed) connection. 1 WAN Port (for hookin' up the ADSL/Cablemodem). Reset button. For restarting the router (brief single click) or restting to factory settings (keep it pressed for 3 seconds). The DIAG will briefly go on and off. Duplicate the settings show in the image above, for use with ADSL van KPN (MXStream). Copy all settings and click "APPLY". 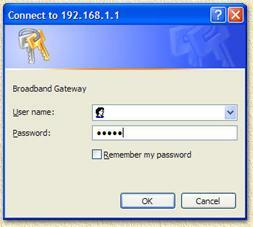 Check 'PPTP' and enter username and password. After doing so, start on the PC, a browser, for example Internet Explorer, and open a great website (http://www.weethet.nl/). The router LEDs will now reflect activity. Tip: remove any dialup adapter on your PC and configure Internet Explorer to use LAN only!